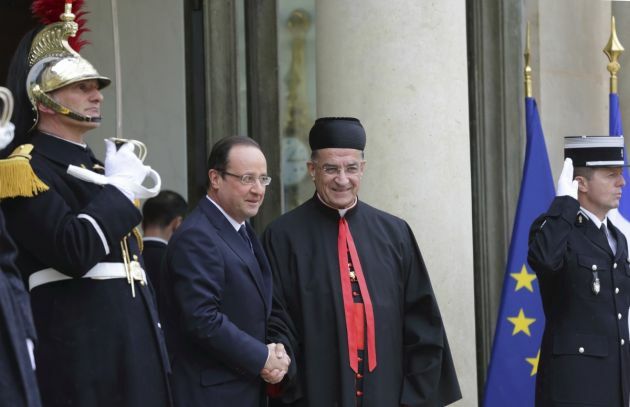 (Photo: REUTERS / Philippe Wojazer)French President Francois Hollande (L) greets Cardinal Bechara Boutros Rai of Lebanon at the Elysee Palace in Paris April 9, 2013. GENEVA - Christians in the Middle East face frequents dangers, are often caught in the crossfire of different conflicts and they are sometimes targeted individually. But the mainstream Christian leaders there deny they are a minority that is being persecuted as is sometimes the portrayal. Lebanese Cardinal Bechara Boutros Rai spoke at the United Nations in Geneva on "Christians and the Future of the Middle East," on Wednesday stating that they are an integral part of the social fabric in the region. "Christians have been living in the Middle East since the dawn of Christianity, 600 years before Islam," said Rai who is the Maronite Patriarch of Antioch and All the East speaking at the Palace of Nations. His sentiments echo those made by Holy Land Lutheran Bishop Munib Younan who is President of the Lutheran World Federation. The U.N. lecture was arranged by Archbishop Silvano Tomasi, the Holy See's representative at the United Nations in Geneva. "They have enriched the cultures of the region with their different oriental traditions; that of Alexandria, Antioch, Armenia, Constantinople and the Chaldean tradition, over and above the Roman tradition," said the Maronite Patriarch. The lecture followed the April 2 statement by the Catholic Ordinaries in the Holy Land and the Justice and Peace Committee about the persecution of Christians in the Middle East. They noted that in many parts of the Western world "persecution" is the word on many people's lips. "It is said that Christians are being persecuted in the Middle East today. However, what is really happening? How should we speak in truth and integrity as Christians and as Church about the suffering and violence that are going on in the region?" They said, "We must point out that Christians are not the only victims of this violence and savagery. Secular Muslims, all those defined as 'heretic', 'schismatic' or simply 'non-conformist' are being attacked and murdered in the prevailing chaos. "In areas where Sunni extremists dominate, Shiites are being slaughtered. In areas where Shiite extremists dominate, Sunnis are being killed. "Yes, the Christians are at times targeted precisely because they are Christians, having a different set of beliefs and unprotected. However they fall victim alongside many others who are suffering and dying in these times of death and destruction." In his lecture Cardinal Rai noted the historic of life in common between Christians and Muslims who lived "through happy as well as difficult times, is suffering" currently due to deep instability for a number of reasons. The Patriarch cited the dislocation of Arab regimes suffering repeated coups d'état. "Those coups d'état have given rise to regimes which, under the cover of lay States, have done nothing but consolidate an Islamic religious system, with one-party regime, one vision, monopolizing political opinion and power, and marginalizing everyone else." The second destabilizing factor was the creation of Israel that opened an enduring conflict with Arab countries, drawing the region into an ideological, religious and confessional struggle. The third was the triumph of the Iranian Revolution under Ayatollah Ruhollah Khomeini and the creation of the Islamic Republic of Iran. This shook up Arab States and led to a political conflict between the Sunni and the Shiite countries. Then there has been the sharp escalation of Islamist groups that consider the use of violence and even the destruction of Islamic societies to be legitimate such as the Muslim Brothers, A1 Quaeda, A1 Nusra and Dahesh. "Those fundamentalist groups replaced the popular pacific manifestations which were, very legitimately, seeking the political, social and economic reforms in the different Arab countries. "They profited from the financial, military and political support of many Eastern as well as Western countries," said Cardinal Ria. Such groups demand the application of Islamic Sharia law, for the formation of Islamic republics, and the substitution of national citizenship for the adoption of Islam. This is an Islamic fundamentalism that rejects the cordiality that existed for centuries and uses the name of God support its interests as they use violent means to achieve power. The Patriarch said that the Christian presence in the Middle East contributes to the development of its countries. "Christians pass on to Muslim societies their moral and human values, and promote modernity, freedom, human rights and the dignity of the human person. 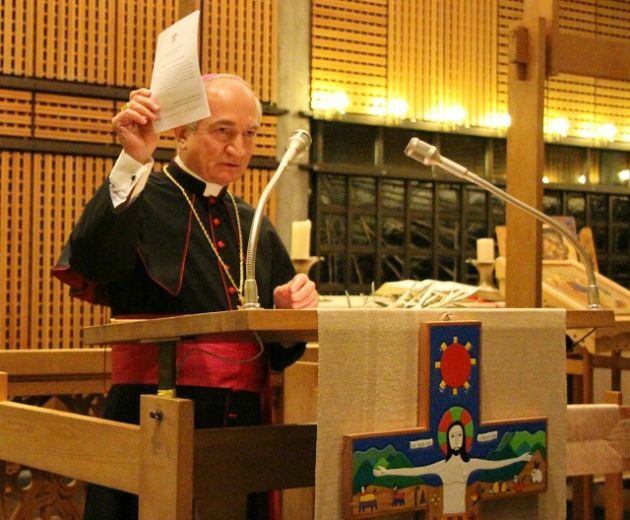 (Photo: Ecumenical News/Peter Kenny)Monsignor Silvano Tomasi, the Vatican's diplomatic representative to the United Nations, delivers an address at the interreligious service to pray for peace at the Ecumenical Center in Geneva on January 21, 2013. "Thus Christianity has become an essential part of the culture of those countries, and it has also profited from Islamic values and traditions. This Christian Muslim cultural interaction has resulted in a spirit of openness and modernity for the majority of Muslims. This constitutes a sign of hope for a better future for the Middle East." He explained that churches are bonded together in interchurch and ecumenical fellowship. On the regional level, there is a Council for the Catholic Patriarchs of the East; the regional Commissions for Catechesis, the family and the lay apostolate. There is also the Middle East Council of Churches, in which are grouped together the four families of churches: the Catholic Churches, the Orthodox Churches, both Eastern and Oriental, and Protestant churches. Regarding solutions Rai said the resolution of Israeli-Palestinian issue with justice for Palestinians is key. He also said, "A radical solution ought to be adopted in the countries of the Middle East which consists in convincing Jews and Muslims to separate Religion and Politics, as is the case with Christianity." The Patriarch said Lebanon offers a model for this. "It constitutes the only exception in all the countries of the Middle East, as it separates Religion and Politics and forms a civil State where Christians and Muslims live together according to the National Pact of 1943, in a conviviality regulated by the Lebanese Constitution." Regarding Syria Ria noted that Pope Francis has been calling for a political solution through dialogue which leads to just and lasting solutions. Pope Francis, he said, insists that "the crisis can only be resolved through dialogue and negotiations, with full respect for justice and the dignity of every person, especially the weak and helpless." Archbishop Tomasi said in an interview that there did not appear to be the political will for another round of peace negotiations in Geneva and in the interim there needs to be the premises for a ceasefire worked out. "The No. 1 priority that becomes a moral imperative from the point of view of all religious authorities is that a ceasefire must come about and we have to put a halt to the killing in Syria." Tomasi has said that the laying down of arms and the stopping of arms funding and the flow of arms which feed the escalation of violence and destruction are part of this priority. "The cessation of hostilities serves the interests of the whole world; it is a human imperative which represents the first step towards reconciliation."